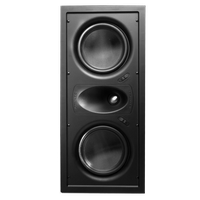 Having the option of in-wall and in-ceiling speakers, within the same voice and timbre matching is exactly what our GHT Series offers. This versatility allows you to create the perfect home theater set up. Featuring our wave guide tweeter that gives you flexibility in directing the sound stage to fit any room. The finishing touch of our magnetic Ghost-style frameless grill features a mere 2mm reveal. No home theater is complete without a subwoofer for the low end...check out our in-room and in-wall options. Ghost HT™ Series in-wall frameless LCR, dual 5" injected poly woofers, 1" soft silk tweeter, 5-100 watts, 8Ω, includes white & black grills. Sold each. Ghost HT™ Series in-wall frameless LCR, dual 6 1/2" glass fiber woofers, 1" aluminum tweeter, 5-150 watts, 8Ω, includes white & black grills. Sold each. Ghost HT™ Series in-wall frameless LCR, dual 6 1/2" injected poly woofers, 1" soft silk tweeter, 5-125 watts, 8Ω, includes white & black grills. Sold each. 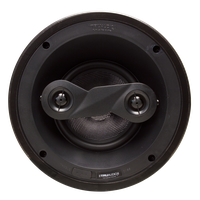 Ghost HT™ Series in-ceiling bipole surround, 6 1/2" glass fiber woofer, dual 1" titanium swivel tweeters, 5-150 watts, 8Ω, includes white & black grills. Sold each. Ghost HT™ Series in-wall frameless bi-pole surround, 6 1/2" glass fiber woofers, dual 1" aluminum tweeter, 5-150 watts, 8Ω, includes white & black grills. Sold each. 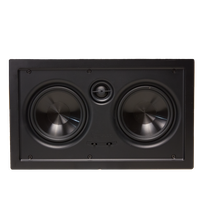 Ghost HT™ Series in-wall frameless bi-pole surround, 6 1/2" injected poly woofer, dual 1" silk dome tweeters, 5-125 watts, 8Ω, includes white & black grills. Sold each.